of the barns and "extras" of which photographs are included in this album. Sketch map. 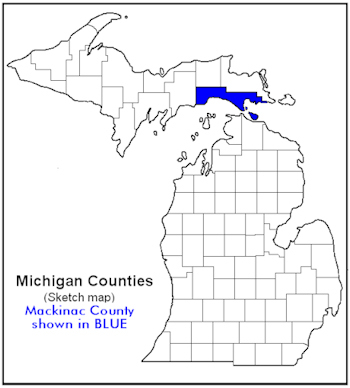 Locations of townships within Mackinac County. The black and white dashed lines indicate the approximate boundaries between adjacent townships. The two-letter indicators on this map are used to designate the townships where the barns are located in both the captions of the photographs and on the following list. West to east the correlations of the two-letter indicators and full names are: Ne-Newton, Po-Portage, Ga-Garfield, Hu-Hudson, He-Hendricks, Mo-Moran, Br-Brevort, Si-St. Ignace, Ma-Marquette, Bb-Bois Blanc, and Cl-Clark. Two additional indicators, MIC and SIC, are similarly utilized for the included barns that are on Mackinac Island and in St. Ignace, respectively. List of photographed barns and"extras" by Townships. 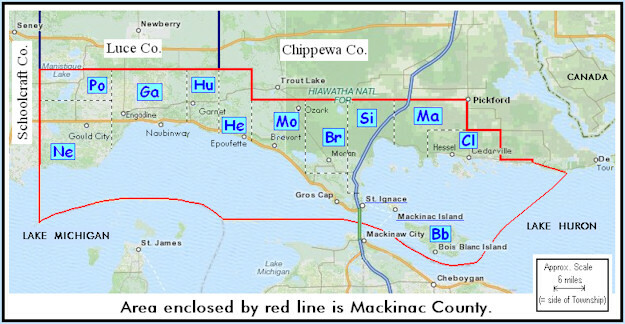 These locations are plotted by number on the latest Plat Book ... (Mackinac County ..., 2009). The page number in that book is given directly after the number given each structure on this list. That book and additional photos on CD are on file in the XXnameXX Library, XXplaceXX, Michigan. _____ Bb1. (p. 44=extra #1) north of Lime Kiln Point Rd. ; SE¼ sec.17* T.39N.-R. 2W. *see text re section designation. Br1. (p. 36=extra #2) east of H57; SW¼ sec.2, T.41N.-R.5W. Br2. (p. 36) west of H57; NW¼ sec.2, T.41N.-R.5W. Br3. (p. 37) south of H57; NW¼ sec.5, T.41N.-R.4W. Br4. (p. 31=extra #3)) north of H57; NW¼ sec.32, T.42N.-R.4W. Br5. (p. 31) north of Dukes Rd. ; NE¼ sec.31, T.42N.-R.4W. Br6. (p. 31) south of Dukes Rd. ; SE¼ sec.31, T.42N.-R.4W. Br7. (p. 37=extra #4) north of Rte. 129; SE¼ sec.4, T.41N.-R.4W. Br9. (p. 30) west of Black Point Rd. ; SE¼ sec.25, T.42N.-R.5W. Br10. (p. 37) east of Langdon Rd. ; NE¼ sec.5, T.41N.-R.4W. Br11. (p. 31) east of Martin Rd. ; NW¼ sec.33, T.42N.-R.4W. Br12. (p. 30=extra #5) west of Black Point Rd. ; SW¼ sec.36, T.42N.-R.5W. Cl1. (p. 34) north of Nye Rd. ; SW¼ sec.21, T.42N.-R.1W. Cl2. (p. 34=extra #6) south of State St.; SW¼ sec.25, T.42N.-R.1W. Cl3. (p. 35) east of Meridian St.; NW¼ sec.31, T.42N.-R.1E. Cl4. (p. 35) north of Norquist Rd. ; SE¼ sec.18, T.42N.-R.1E. Cl5. (p. 35) north of Swede Rd. ; SE¼ sec.7, T.42N.-R.1E. Cl6. (p. 35) west of Winberg Rd. ; SW¼ sec.9, T.42N.-R.1E. Cl7. (p. 35) north of Swede Rd. ; SW¼ sec.9, T.42N.-R.1E. Cl8. (p. 35) south of Swede Rd. ; NE¼ sec.15, T.42N.-R.1E. Cl9. (p. 35) east of Rte. 129; SW¼ sec.18, T.42N.-R.1E. Cl11. (p. 35) south of 30 Mile Rd. ; NE¼ sec.1, T.42N.-R.1E. The following sketch map shows the locations of the barns shown by photographs in this album. It is given, along with the list of locations, because the numbers of the photographs, and thus of the locations, do not have any logical relationship to the roads and geography. They are, instead, in the order in which the photographs were taken, and that depended upon such things such as light conditions and traffic. It is hoped that the map will aid anyone going through the area who might want to correlate their travel plans and routes they take to see the photographed barns. Ga1. (p. 11) east of Rte. 117; SW¼ sec.16, T.44N.-R.10W. Ga2. (p. 11) east of Rte. 117; NW¼ sec.16, T.44N.-R.10W. Ga3. (p. 11) west of Rte. 117; SE¼ sec.8, T.44N.-R.10W. Ga4. (p. 17)west of Price Rd. ; NE¼ sec.30, T.43N.-R.10W. Ga5. (p. 17)south of Linck Rd. ; NW¼ sec.18, T.43N.-R.10W. Ga6. (p. 17)south of Linck Rd. ; NE¼ sec.18, T.43N.-R.10W. Ga7. (p. 17)east of Pleasant Ave.; NW¼ sec.8, T.43N.-R.10W. Ga8. (p. 17)west of Pleasant Ave.; NE¼ sec.7, T.43N.-R.10W. Ga9. (p. 17)east of Pleasant Ave.; SW¼ sec.5, T.43N.-R.10W. Ga10. (p. 17)west of Price Rd. ; SE¼ sec.19, T.43N.-R.10W. Ga11. (p. 17)north of Price Rd. ; NW¼ sec.20, T.43N.-R.10W. Ga12. (p. 17=extra #7)north of Linck Rd. ; SE¼ sec.8, T.43N.-R.10W. Ga13. (p. 17=extra #8)west of Pleasant Ave.; SE¼ sec.6, T.43N.-R.10W. Ga14. (p. 11)north of Patzen Rd. ; SW¼ sec.31, T.44N.-R.10W. Ga15. (p. 11)east of Pleasant Ave.; SW¼ sec.32, T.44N.-R.10W. Ga16. (p. 11=extra #9)west of Pleasant Ave.; NE¼ sec.31, T.44N.-R.10W. Ga17. (p. 11)east of Pleasant Ave.; NW¼ sec.32, T.44N.-R.10W. Ga18. (p. 11)north of Kovar Rd. ; NW¼ sec.30, T.44N.-R.10W. Ga19. (p. 17)east of Krause Rd. ; SW¼ sec.10, T.43N.-R.10W. Ga20. (p. 17)south of Raski Rd. ; NE¼ sec.9, T.43N.-R.10W. Ga21. (p. 17)north of Raski Rd. ; SW¼ sec.3, T.43N.-R.10W. Ga22. (p. 17)east of Indian Trl. ; SW¼ sec.2, T.43N.-R.10W. Ga24. (p. 17)north of Hiawatha Trl. [Rte. H40]; NE¼ sec.15, T.43N.-R.10W. Ga25. (p. 17)west of Krause Rd. ; NE¼ sec.4, T.43N.-R.10W. Ga26. (p. 11) west of Krause Rd. ; SE¼ sec.33, T.44N.-R.10W. Ga27. (p. 17) west of Indian Trl. ; NE¼ sec.10, T.43N.-R.10W. Ga29. (p. 17) west of Indian Trl. ; SE¼ sec.10, T.43N.-R.10W. Ga30. (p. 17) southeast of Raski Rd. ; SE¼ sec.9, T.43N.-R.10W. Ga31. (p. 17) south of Raski Rd. ; SW¼ sec.9, T.43N.-R.10W. Ga32. (p. 11=extra #10) west of Krause Rd. ; NE¼ sec.33, T.44N.-R.10W. Ga33. (p. 11) east of Krause Rd. ; NW¼ sec.27, T.44N.-R.10W. Ga34. (p. 11) south of McKelvey Rd. ; NW¼ sec.27, T.44N.-R.10W. Ga35. (p. 11) north of McKelvey Rd. ; SW¼ sec.21, T.44N.-R.10W. Ga36. (p. 11) west of Krause Rd. ; SW¼ sec.21, T.44N.-R.10W. Ga37. (p. 11) west of Krause Rd. ; NW¼ sec.21, T.44N.-R.10W. Ga38. (p. 11) north of Sandtown Rd. ; SW¼ sec.15, T.44N.-R.10W. Ga39. (p. 11) west of Krause Rd. ; SE¼ sec.16, T.44N.-R.10W. Ga40. (p. 11) east of Krause Rd. ; SW¼ sec.15, T.44N.-R.10W. Ga41. (p. 11) east of Krause Rd. ; NW¼ sec.15, T.44N.-R.10W. Ga42. (p. 11) east of Krause Rd. ; NW¼ sec.15, T.44N.-R.10W. Ga43. (p. 11) west of Krause Rd. ; NW¼ sec.16, T.44N.-R.10W. Ga44. (p. 11) north of Brown Rd. ; SE¼ sec.9, T.44N.-R.10W. Ga45. (p. 11) east of Rte. 117; NW¼ sec.21, T.44N.-R.10W. Ga46. (p. 11) west of Rte 117; SE¼ sec.20, T.44N.-R.10W. Ga47. (p. 11) south of McKelvey Rd. ; NW¼ sec.29, T.44N.-R.10W. Ga48. (p. 11) south of McKelvey Rd. ; NE¼ sec.29, T.44N.-R.10W. Ga49. (p. 17) west of Rte.117; NE¼ sec.17, T.43N.-R.10W. Ga50. (p. 17) east of Rte.117; SW¼ sec.4, T.43N.-R.10W. Ga51. (p. 17) west of Rte.117; SE¼ sec.5, T.43N.-R.10W. Ga52. (p. 17) west of Rte.117; NE¼ sec.5, T.43N.-R.10W. Ga53. (p. 17) west of Rte.117; NE¼ sec.5, T.43N.-R.10W. Ga54. (p. 11) west of Rte.117; SE¼ sec.32, T.44N.-R.10W. Ga55. (p. 11) west of Rte.117; SE¼ sec.32, T.44N.-R.10W. Ga56. (p. 11) west of Rte. 117; NE¼ sec.32, T.44N.-R.10W. Ga57. (p. 17) east of Rte. 117; NW¼ sec.4, T.43N.-R.10W. Ga59. (p. 11) west of Rte. 117; SW¼ sec.29, T.44N.-R.10W. Ga60. (p. 17) north of Hiawatha Trl. ; NW¼ sec.15, T.43N.-R.10W. Ga61. (p. 11) northeast of Warner Rd. ; NE¼ sec.27, T.44N.-R.10W. He1. (p. 20=extra #11) north of Epoufette Bay Rd. ; SW¼ sec.3, T.42N.-R.7W. He3. (p. 20) south end of Kenyon Rd. ; NE¼ sec.8, T.42N.-R.7W. Hu1. (p. 19=extra #12) west of Black River Rd. ; SE¼ sec.19, T.43N.-R.8W. Ma1. (p. 25=extra #13) east of Simmons Rd. ; SW¼ sec.30, T.43N.-R.2W. Ma2. (p. 33) south of St. Ignace Rd. ; NE¼ sec.9, T.42N.-R.2W. Ma3. (p. 33=extra #14) north of St. Ignace Rd. ; SE¼ sec.9, T.42N.-R.2W. Ma8. (p. 26) south of Rockview Rd. ; NW¼ sec.36, T.43N.-R.1W. Mo1. (p. 41) northwest of New Portage Rd. ; NW¼ sec.14, T.40N.-R.3W. Mo2. (p. 41) south of Old Portage Rd. ; NW¼ sec.1, T.40N.-R.3W. Mo3. (p. 41) northwest of Martin Lake Rd. ; NW¼ sec.9, T.40N.-R.3W. Mo4. (p. 22) north of Lovegrove Rd. ; SE¼ sec.4, T.43N.-R.5W. Mo6. (p. 41) east of Gros Cap Rd. ; NW¼ sec.8, T.40N.-R.4W. Ne1. (p. 16) west of Greenwald Rd. ; NE¼ sec.25, T.43N.-R.11W. Ne2. (p. 16) south of Rte. 2; NE¼ sec.25, T.43N.-R.11W. Ne3. (p. 15=extra #16) north of Brotherton Rd. ; SW¼ sec.2, T.43N.-R.12W. Ne4. (p. 16) north of Clark Rd. ; SE¼ sec.28, T.43N.-R.11W. Ne5. (p. 16) east of Brawley Rd. ; NW¼ sec.26, T.43N.-R.11W. Ne6. (p. 28) west of S. Gould City Rd. ; SW¼ sec.28, T.42N.-R.11W. Ne7. (p. 28) west of S. Gould City Rd. ; SW¼ sec.28, T.42N.-R.11W. Ne8. (p. 16) south of Main St., Gould City; SW¼ sec.28, T.43N.-R.11W. Ne9. (p. 16) north of Hiawatha Trl. [=H40]; NE¼ sec.23, T.43N.-R.11W. Ne10. (p. 16=extra #15) north of Hiawatha Trl.=H40]; NE¼ sec.23 T.43N.-R.11W. Ne11. (p. 16) north of Clark Rd. ; SE¼ sec.28, T.43N.-R.11W. Po1. (p. 10) east of Rte. H-33, SW¼ sec 30, T.43N.-R.11W. Po2. (p. 9) east of County Line Rd., SW¼ sec.7, T.44N.-R.12W. Po3. (p. 9) south of Ketola Rd., NE¼ sec.7, T.44N.-R.12W. Po4. (p. 9) east of County Line Rd., NW¼ sec 7, T.44N.-R.12W. Po5. (p. 9=extra #17) east of McGahn Rd., SE¼ sec 17, T.44N.-R.12W. Po7. (p. 10) north of Sandtown Rd., SW¼ sec.17, T.44N.-R.11W. Si1. (p. 32) north of Charles Moran Rd. ; SE¼ sec.30, T.41N.-R.3W. Si2. (p. 32) west of Pine River Rd. (south of Rte. 134); NE¼ sec.10, T.42N.-R.3W. Si3. (p. 37) south of Rte. 129; NE¼ sec.11, T.41N.-R.3W. Si4. (p. 32) north of St. Ignace Rd. ; SE¼ sec.1, T.42N.-R.3W. MIC1. (p. 42)East of Market St.; SW¼ sec.14, T.40N. R.3W. MIC3. (p. 42)Southwest of Cadotte St.; NE¼ sec.15, T.40N. R.3W. MIC6. (p. 42)North of Algonquin Rd. ; SW¼ sec.10, T.40N. R.3W. MIC7. (p. 42)North of Algonquin Rd. ; SW¼ sec.10, T.40N. R.3W. MIC8. (p. 42)North of Algonquin Rd. ; SW¼ sec.10, T.40N. R.3W. MIC12. (p. 42)North of Park Rd. ; SW¼ sec.3 , T.40N. R.3W. MIC13. (p. 42)East of Carriage Rd. ; SE¼ sec.10, T.40N. R.3W. SIC1. (p. 41& 49) north of Ferry Lane; SW¼ sec.17, T.40N.-R.3W. SIC2. (p. 41& 49) south of Burdette St.; SW¼ sec.17, T.40N.-R.3W. SIC3. (p. 41& 48) north of Portage St.; SW¼ sec.7, T.40N.-R.3W. SIC4. (p. 41& 48=extra #18)) south of Prospect St.; NW¼ sec.18, T.40N.-R.3W.